This Game Doesn't Need Guns Or Explosions To Make You Care. Just A House. 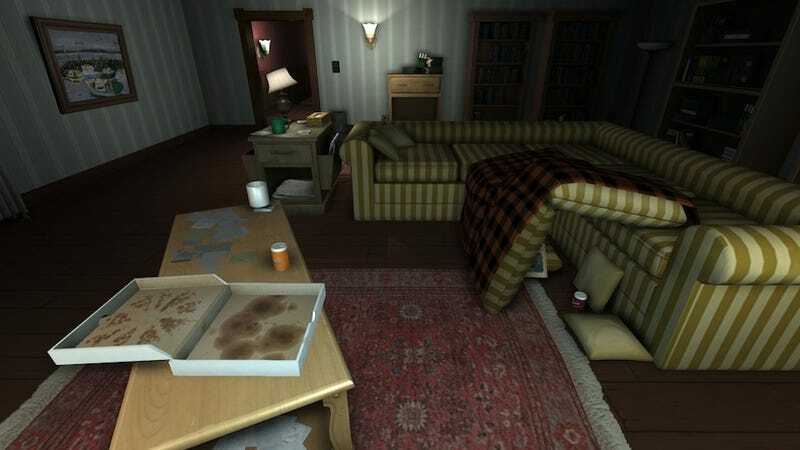 If you've played a game, you've probably encountered some form of environmental storytelling. In Left 4 Dead, safe rooms have notes scrawled on the wall from past apocalypse survivors, frantic missives to whomever comes along. In Fallout 3, a long-abandoned gas station reveals that its past occupant liked to play dominoes. And, perhaps most famously, the wall of a hidden room in Portal betrays the sinister nature of the Aperture test facility, and a vital truth about the cake. Environmental storytelling usually exists alongside a game, a storytelling garnish to another, more direct tale. But what if environmental storytelling was the entire point of the game? That's the premise of Gone Home, an adventure and exploration game from the Fullbright Company, due out on PC, Mac and Linux in the second half of 2013. It's a game steeped in mystery and atmosphere, and one that hits a rhythm that isn't quite like anything I've recently played. In the game, you play as a young woman named Katie who is returning from traveling overseas to her home in fictional Boone County, Oregon in 1995. She returns to find her house empty, with a note on the front door from her teenaged younger sister Sam asking Katie not to look for her. And that's the whole setup—players must then move about the house, picking up and examining items and gradually plumbing the depths of the building and learning the story of those who lived there. The house itself was partially inspired by Japanese "Haikyo" houses, abandoned buildings in Japan that can go undiscovered for years, leaving behind clues about their inhabitants. I played through an early build of Gone Home comprising of its first act—two floors of the house, through which I learned a great many things about Katie's little sister Sam, as well as some smaller, more subtle things about their parents. Letters from her father's employer at a Hi-Fi equipment review magazine, coupled with a bottle of whiskey hidden atop a shelf, painted a picture of a man frustrated with the rote nature of his job, a writer who wished to bring more personal expression to his work, much to the chagrin of his bosses. A mug from the Oregon Forestry Department showed me that Katie's mother used to work outdoors. I emailed some with Steve Gaynor, leader of the small team making Gone Home. (Full disclosure: Gaynor and I are friendly; I've liked the guy since meeting him at the Game Developers' Conference a couple years back.) I asked him about how it's possible to form a human connection with a character you never even see. "That's kind of the point, right?" he said. "To forge a human connection with this character, in a totally different way than most games do." "In that way," Gaynor said, "maybe what we're doing is kind of a reaction to other games. A lot of times you'll see developers try to make you connect with a character by making you watch them do a lot of animations, emote straight into the camera, get big shiny tears on their faces and dance all over the uncanny valley to try and win you over... we wanted to make a game where you really get to know these characters, make a connection with them and come to understand them personally, not by watching them perform for you—in fact by cutting them out of the scene entirely, and giving you access to all the ephemera of their lives: Where they lived, what they left behind, how they communicated with each other and what they hid from each other and what they hid from themselves. We hope that you'll come away from Gone Home feeling a deeper connection to these characters than you've felt in other games." From what I played, it's working. In part, that's because the writing is strong—Sam is a writer, and she leaves bits and pieces of her short stories lying around. As I read them, I got a sense of an immature but strong voice revealing itself, and other, more personal truths, hiding between the lines. In a particularly nice touch, Sam has one of her childhood stories tucked away in her closet: The poor spelling and little-kid scrawl still show a bright imagination at work. I was reminded of the stories I used to write as a kid, and the many ways I'm still writing those stories today. Despite its unorthodox design, it's actually Gone Home's 1990s setting that might resonate most with players. Many games these days trade on nostalgia, but it's nostalgia of a very specific sort: Games use chiptune soundtracks and retro graphics to make us remember the games we played when we were kids. However, they're rarely actually set during a time that gamers of my generation can easily recognize. One look at the concert posters, magazines, mix-tapes, and VHS tapes littering the house in Gone Home and I was transported to a home I'd never visited, but that felt achingly familiar. Gaynor said that he thinks Fullbright is lucky to be out on the cusp of the current 90s nostalgia wave, at least as it pertains to video games. "I think in video games specifically it's the case that very few games can take advantage of the familiarity of domestic life, because of the constraints of genre," he said. "You make a shooter, or an RPG, or a strategy game and you have to make an excuse for why there are so many dudes to kill... you make a puzzle game, and why all the crazy puzzles? Gone Home is just a house, maybe a kind of eccentric house but a house where a normal family lived, with no overarching requirements for genre conventions. It gives us the freedom to explore themes that people have actually experienced in their own lives, and have a genuine connection with." It's difficult to articulate the feeling of exploring the house in Gone Home, particularly as I got deeper and deeper into the first act (which, all told, I played through in around an hour). It feels familiar yet strange; Gaynor told me they're trying to evoke the feeling of visiting a friend's house and not quite knowing where everything is, but understanding the people based on the items laying about. That feels about right. There's a specificity to everything—there are often individual books on the shelves with legible spines, and they're never repeated—unlike most games, you won't see the same half-dozen books throughout the house. The same thing goes for VHS tapes, photos, paintings and magazines—anything in the house that is specific is also unique. Gaynor has written in the past about the concept of "specific violence," and how the anonymity and repetitiveness of most video game violence robs it of its impact. Citing BioShock in particular, (Gaynor worked on both BioShock 2 and BioShock Infinite, and wrote the fantastic BioShock 2 DLC Minerva's Den), he talks about how much more impactful the death of the singular and unreplaceable Andrew Ryan was than a run-of-the-mill, copy-pasted Splicer. There may not be any shooting or electrocuting in Gone Home, but a similar ethos prevails—everything in this house is specific and unique, and as a result, has weight. That coffee mug you just found was mom's coffee mug, and it lends the world far more weight than a thousand copy-pasted bottles of Fallout's Nuka-Cola. Despite my soft poking at the metaphors that may exist in this big, empty house, Gaynor insists that Gone Home is "extremely literalist," a game that's not an allegory, nor one filled with symbolism. And yet I found it to be rich with metaphor. At the start of the game, you stand in a foyer, shadows hiding the corners of the large room before you. As you move through the house, each new room you come upon is dark, and you must turn on the lights, one by one. In so doing, you slowly shine a light on this family and these people, uncovering and illuminating them, one clue at a time.